1. Wrap a piece of cloth around the tip of the flat-head screwdriver to avoid scratching. 2. 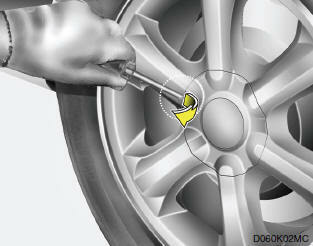 Insert the flat-head screwdriver into the notch of the wheel cap and pry gently to remove the wheel cap. 3. Change the flat tire. 4. Reinstall the wheel cap by fitting the boss of the wheel cap in the notch of the wheel, hitting the center of the wheel cap with your hand.